John Mickelson's Soap Box – Good clean info and advice to thrive in the fitness industry! IHRSA 2019 has come and gone with Augie’s Bash being the final event. This year Augie’s Bash was held in a new venue in the convention center. Close to 2 million dollars was raised and the news of the start of human testing was celebrated. Not only is the goal to eliminate ALS but there is hope the experimental drug will also help treat Parkinson and Alzheimer’s. I partnered-up with several other fitness organizations through “Caritate” my non-profit organization to make sure we did our part to maximize the funding of Augie’s Quest. Its uplifting to be a part of a movement wanting to make a difference in the fight to conquer ALS and provide hope for people that have this horrible illness. Caritate gives me the vehicle to make a difference and give back to others. Welcome to the online archive of John’s SoapBox. A Message From John…As many of you may know, I publish a monthly blog in which I feature the leaders in health and fitness club management. Since my entree into the industry back in 1984, I’ve had the good fortune to cross paths with many knowledgeable, fun, passionate, motivated and caring people. These special people have changed the lives of their member’s and now via the SoapBox, we have a way to honor them and share their stories. Boston — March 27, 2019— More than 71.5 million consumers utilized U.S. health clubs in 2018, a record-high since IHRSA began tracking health club utilization in 1987. The number of individual members totaled 62.5 million, up 2.6% from 60.9 million in 2017. In all, consumers frequented their health clubs for more than six billion visits in 2018. Based on a study conducted by The International Health, Racquet & Sportsclub Association (IHRSA) as part of the Physical Activity Council (PAC), more than one out of five Americans (20.8%) belong to at least one U.S. health club or studio. Since 2008, membership has grown by 37.1%, while the total number of club-goers has increased by 34%. 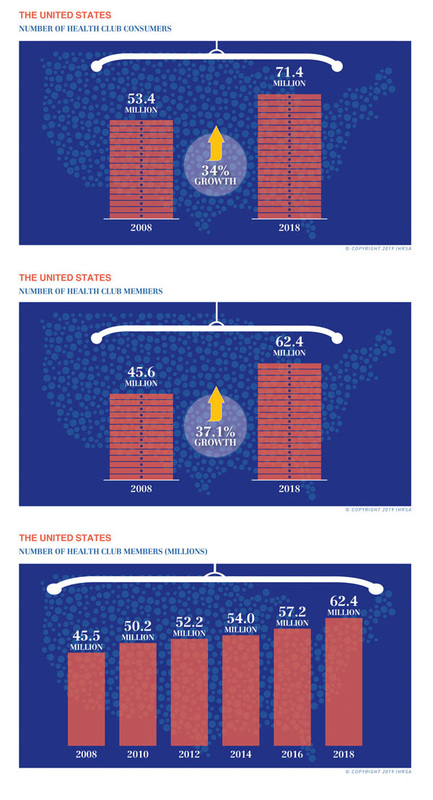 The total number of health club visits has also increased, amounting to 6.1 billion visits in 2018, up from 4.3 billion in 2008. At 39,570, the number of health club facilities increased by 2.8% over the previous year, up from 38,477 locations. In 2018, U.S. health club industry revenue increased to $32.3 billion, up from $30 billion in 2017, an improvement of 7.8%. Later this year, IHRSA will release the 2019 IHRSA Global Report (June) that will provide an overview of the worldwide health club industry and the 2019 IHRSA Health Club Consumer Report (Sept), which will provide analysis of health club consumer growth, demographics, utilization, and trends as well as insights and applications for club operators. The 2018 IHRSA Health Club Consumer Report is available on IHRSA’s website. Methodology: Each year, IHRSA conducts an annual health club consumer study as part of the Physical Activity Council (PAC). The PAC is made up of six of the leading sports and manufacturer associations that are dedicated to growing participation in their respective sports and activities. During 2018, a total of 20,069 online interviews were carried out with a nationwide sample of individuals and households from the US Online Panel of over one million people operated by IPSOS. The total panel is maintained to be representative of the US population for people ages six and older. Oversampling of ethnic groups took place to boost responses from typically under responding groups. The International Health, Racquet & Sportsclub Association is a not-for-profit trade association representing health and fitness facilities, gyms, spas, sports clubs and suppliers worldwide. Its mission is to grow, promote and protect the health and fitness industry. As the leading authority on the commercial health club industry, IHRSA regularly conducts primary consumer research and industry economic and operating studies. For more information on IHRSA research, visit the IHRSA website. Happy News Years to everyone! 2018 is beginning to feel like a record year with the amount of orders that are streaming into our order desk. Fitness facilities seem to be packed with new members and I’m optimistic that “fitness” is going to be back in fashion again. January’s Soapbox will be one of our best ever. Lots of new content furnished by experts new to the Soapbox, its exciting to be meeting all these new people and their desire to help people achieve a better quality of life. If you have a suggestion for a topic to be highlighted, please let me know and we will do everything we can to be accomadating. Just about every person I know has been affected by the flu epidemic. Reviewed figures seem to point to a record flu season. The current flu shot only inoculates you to 30% of the flu viruses which means you more susceptible than in past years to get the flue. As we all know the best way to avoid the flu is “wash your hands” as often as you can! In the first Soapbox article for the January issue, Petra’s “Cleanologist” Franz Johnson speaks to the need to wash your hands and if this isn’t possible, use a hand sanitizer. We have embedded in Franz’s article a video on a test comparison of Petra’s foaming non-alcohol hand sanitizer versus Gojo/Purell’s hand sanitizer. Not only did our foaming hand sanitizer reduce/neutralize/kill more pathogens/bacteria than the Gojo/Purell hand sanitizer but our product is half the cost! I believe your will find Franz’s video not only entertaining but very educational. I cannot even begin to tell you how many men I have seen leaving restrooms without washing their hands….It really irritates me, especially if it means touching the same door handle. Of course, I use a paper towel to shield my clean hands from touching their “junk”. As usual it is the few bad apples that create problems for the rest of us, the old 20/80, 20% (or so) causing 80% of the problem. Oh sure, everyone says “not me”, “I use soap and warm water”. Oh, really? Do you scrub them for a minimum of 20 seconds?Do you wash the backs of them? Between your fingers? Under your nails? Kimberly Berg is on a mission to help people with Parkinson’s Disease (PD) change the course of their disease through exercise and dance. Kimberly calls her students and clients with PD “fighters” because they are fighting a huge battle against an unforgiving disease. Everything she does with her fighters is to help them live their best life and give them hope to keep going, to keep fighting. Today, Kimberly has 200 fighters and 20 very full boxing classes a week offered to 4 levels of fighters. Her fight club “The Rose City Rebels” and her all-female fight club the “Rose City Knock-Outs” bring awareness to the fact that PD is not an old man’s shaking disease, but rather a disease that can also affect women and young people all over the world. Every month they get together for “Fight and Flight” happy hour to show each other support, and go out dancing from time to time because PD is not an excuse to stop living life! The aging population is growing at an unprecedented rate, and those with medical conditions are seeking fitness & allied health professionals with skills to help improve their quality of life and overall health. Education in medical fitness and active aging is more important than ever! The Medical Fitness Tour is working to educate professionals in these fields, so they can effectively work with these populations. Increased knowledge will not only broaden your toolbox, it will help boost your business. PetrA-1 invites you to attend the IHRSA Trade Show in March. Not only do we invite you to attend but we will provide you free access. Click on the following link (https://www.xpressreg.net/register/ihrs0318/attendee/reginfo.asp?hkey=&aban=&sc=BW91331&iq=&k=0&o=&pb=&aa= ) fill in the requested information and your request will be processed and confirmed. The IHRSA International Trade Show is the place for health club operators to discover the newest and best fitness equipment and technology the world has to offer. As we jump into the new year our thoughts often focus on change. We reflect on what we accomplished throughout the year and how we can improve ourselves in the coming year. While we may think we want a better body, a better relationship or a better job, what we really want is to be happy. Happiness isn’t an overrated concept. When we feel happiness other aspects of our lives align. Our physical health improves, our relationships improve, and every day improves. Wellness is holistic happiness. This happiness in all areas of your life is either shadowed or enlightened by one thing, your perspective. While we may not have control over many things in life, perspective is something we decide for ourselves. Amyotrophic lateral sclerosis or ALS, also known as Lou Gehrig’s disease, is a neurodegenerative disease affecting 6,000 people every year. It steals people’s muscles, and robs them of every benefit exercise provides. That’s why for more than a decade, the fitness industry has refused to accept that fate, rallying hundreds of companies, countless professionals, staff, studio and club members and local communities to take on this disease and unifying cause. Augie’s Quest to Cure ALS is the challenge the fitness industry once dared to accept, raised a record-breaking $3.5 million last year alone and more than $35 million total since its inception. This year’s BASH for Augie’s Quest will be in San Diego, CA on March 23, 2018 in conjunction with the IHRSA Tradeshow. December is the month for giving, for making donations at the Salvation Army Red Kettle, for spending time with family and friends and wanting to give back to those less fortunate than ourselves. December is one of my favorite times of the year as it refocus me on what’s really important, helping to make lives better, provide hope and help people achieve a better quality of life. Those of you in the fitness industry are blessed with a bigger than normal heart and your members are often thought of as extended family. As I travel around north America, I’m amazed at the generosity I see in our industry and cherish the friendships I make as so many of you truly do want to make a difference and make the world a better place. In the new year, if there are “Giving Back” experiences you have witnessed or participated in, we would love to hear about them. If there are charitable organizations that need recognition or perhaps a donation, don’t be shy, let us know. We cherish our readership and are looking forward to 2018 as we have some exciting events to share with everyone.